Since it is the 4th of July, I need to amp it up a bit. So, I created a sweet and spicy Red, White and Blue Spinach Salad. I like to play with textures, flavors and spice even when including just a handful of ingredients. Consider the spiciness of the radishes, juiciness of the blueberries and creaminess of the fresh mozzarella paired with the firmness of the baby spinach and sweetness of the dressing, plus the crunch of the walnuts, All bases covered! This salad is totally adaptable for the fruits of your choice including how you make the dressing (blackberries or raspberries instead of blueberries). But, this is a really good combination as is, trust me! It goes with any main course from hamburgers to fish to chicken. It’s a good option for vegetarians as well. To show you how easy it is to make the dressing, you don’t even need a bowl! Everything goes right into your blender. I use my Vitamix which blends everything in 30 seconds. If you are not familiar with this brand or have hesitated in buying it due to its cost, it is so worth it! I make so many recipes in here from my morning protein shake to soups to ice cream to fresh peanut butter to hummus to margaritas and the list continues. The strength of the motor (2.2 horsepower) and the fact that they offer a 7 year warranty is just the icing on the cake. But, I digress, back to the recipe for the salad. The warmth of summer encourages lighter meals, fresher fruits and vegetables and outdoor dining. Next time you are looking for a healthy, flavorful and colorful salad, I hope you try this Sweet and Spicy Spinach Salad. 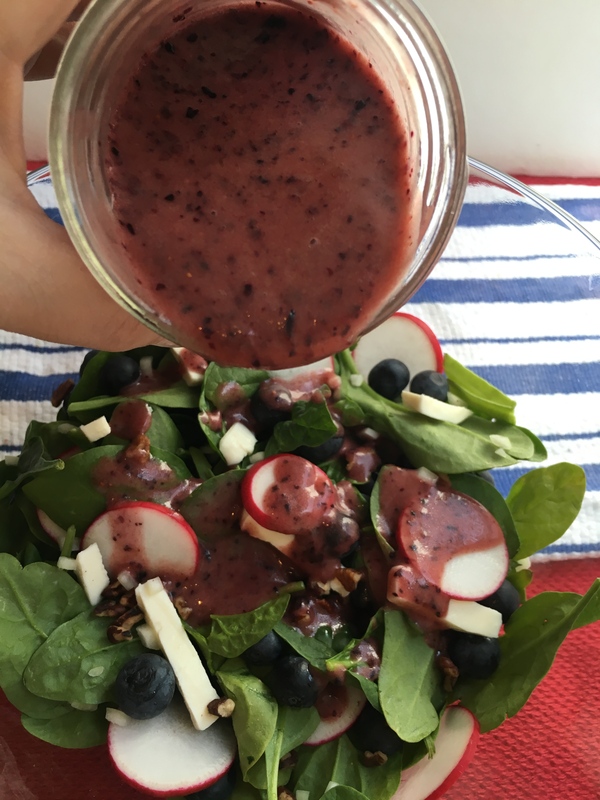 Fresh blueberries and mozzarella and spicy radishes plus a homemade blueberry dressing make a healthy and colorful Fourth of July spinach salad. Dressing: Put all ingredients into Vitamix or blender. Blender until mixed through. If using frozen blueberries, dressing will be thicker. Walnuts: In a small, dry stainless fry pan, warm the walnuts till you begin to smell the oils coming through. About 2-3 minutes. Start with spinach and layer salad with ingredients. If using for the July 4th holiday, the red, white and blue ingredients can be strategically placed to celebrate of the occasion. This salad was great! I made it for our party today and everyone loved the combination of sweet and spicy. Will definitely make this again! I’m a spinach salad fan, so I know I’ll love this salad. I’m always looking for different versions to add to my recipe collection. This one is definitely a keeper. Looks & Sounds Like A Amazing Machine Love The Warranty I Must Get One I’m Blending, Mixing Things ALL The Time I Love To Cook! The Salad Look Delicious I Must Make! This looks like a really nice and healthy combination for a salad. I like that it also has a sweet and sour taste in the salad. Oh I would love this salad. Those flavors sound amazing! I’d love to make that dressing! I love a good spinach salad and this one looks absolutely delicious. I can’t wait to try this dressing, too, because it sounds so appetizing. Thanks for sharing the recipe! This sounds really good. I would never have thought to pair radishes with blueberries. I am going to have to make this for dinner one night this week. Ah, spinach salads are my favorite! I love the looks of this one. I will have to try it out! This looks perfect. I have a bunch of spinach I need to use up. I can’t wait to make this. This looks SO good!!! I love salads and I love trying new versions – need to try this out! It’s perfect for summer! This looks like a yummy salad! Love all the greens and the dressing is just the right thing to have with it. Thanks for sharing this recipe. I’ll save it and make some when we head out for some BBQ this weekend. I love making my own salad dressing that’s why I appreciate posts like this! It’s a great addition to my list of recipes. Salads are always perfect for the summer, it’s a great way to enjoy the fresh produce that we have in the markets! Oh this is so perfect for me! All my favorite flavors on a plate, my family is so picky they wouldn’t eat this but yummy!!! Mmmm, I love this flavor combination. I’d say this is definitely an exciting salad – perfect for a bbq or potluck! I’ve never tried a spinach salad before but this one looks yummy!! I need to try this! !